Our #SundaySupper family is kicking off this holiday weekend and unofficial start to summer fun with recipes showcasing the colors of our nation's symbol of pride and joy. In honor of all our service men and women this Memorial Day, we salute you with our tastiest red, white, and blue treats. Thank you ever so much for your selfless service. I'd also like to say thanks to DB, aka Foodie Stuntman, of Crazy Foodie Stunts for hosting this week's event, and all of our #SundaySupper participants for always sharing the most creative and delicious recipes. Be sure to scroll down past my recipe for the complete listing of Red, White, and Blue recipes being featured this week. 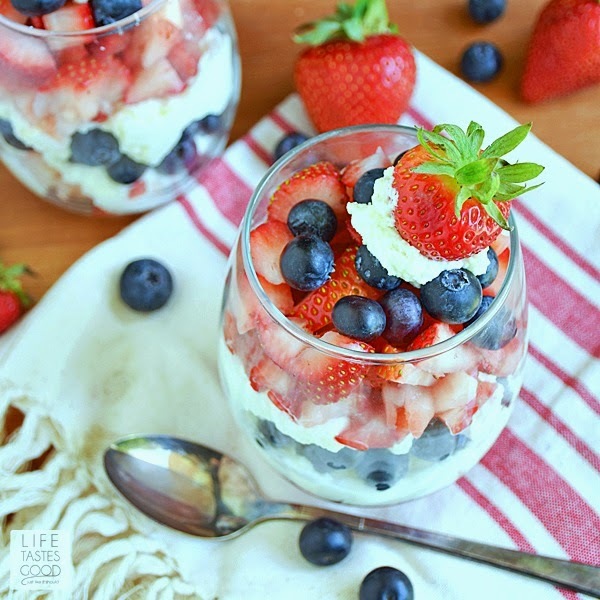 I packed my patriotic recipe full of sweet, juicy strawberries and plump blueberries. The berries not only bring in the colors of our nation, but they are also relatively low in sugar compared to other fruits. As a matter of fact, strawberries are among the fruit with the lowest amount of sugar! That is why these berries are a great choice when making a lower carb dessert. Because I was shooting for a lower carb dessert, I made the creamy filling with Mascarpone cheese. It is my go-to when making a lower carb dessert. It has 0 carbs, is creamy, and you can mix it with anything to create a variety of flavors! I love that kind of versatility! 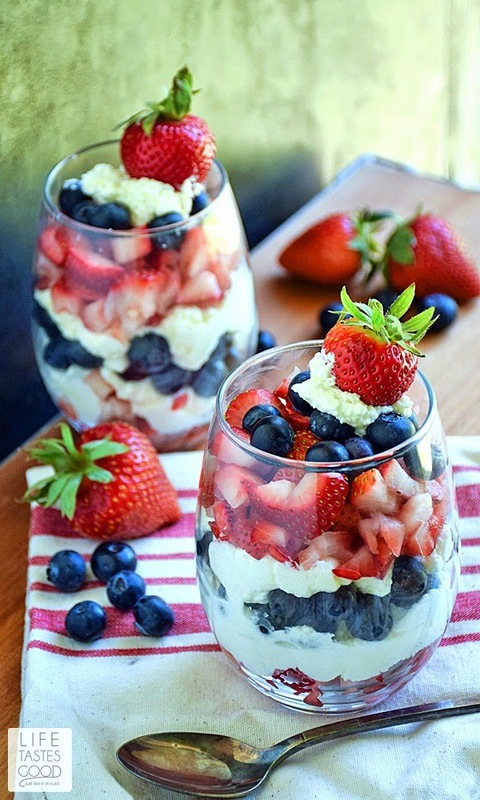 For my Red, White, and Blue Parfaits I combined the Mascarpone cheese with sugar free whipped topping. Although the Mascarpone is creamy, it can be a little stiff, so mixing it with the whipped topping loosens it up a bit and makes it just the right consistency to use in these parfaits. When I was developing this recipe, Don was my official taste tester (as usual). I'm noticing he is getting more and more critical when I ask for his opinion. I'm not sure how I feel about this, but it is definitely good for the recipes! Although he liked the parfait on the first round of recipe testing, he would have liked the cream to be a wee bit sweeter. As a result, on the 2nd go around I added a tablespoon of melted white chocolate to the Mascarpone/whipped topping mixture and he declared that perfection! I have to admit, he is right on this one. I have been enjoying a low-carb diet for a couple months now pretty consistently, so I don't have much of a sweet tooth anymore, but the little bit of sweetness from the white chocolate really did elevate the flavor of this dessert to something pretty amazing! The white chocolate obviously adds more carbs to this dessert, so you might want to leave it out. The fruit adds a natural sweetness and was just right for me, but if you find yourself wanting a little more sweetness, you could add your favorite low-carb sweetener to avoid the extra carbs. To make the cream, microwave 1 tablespoon of white chocolate chips in a microwave safe bowl for about 15 seconds. Stir until melted and add in 4 ounces of Mascarpone cheese. Stir until smooth and then fold in 4 ounces of sugar free whipped topping. Stir gently to combine. 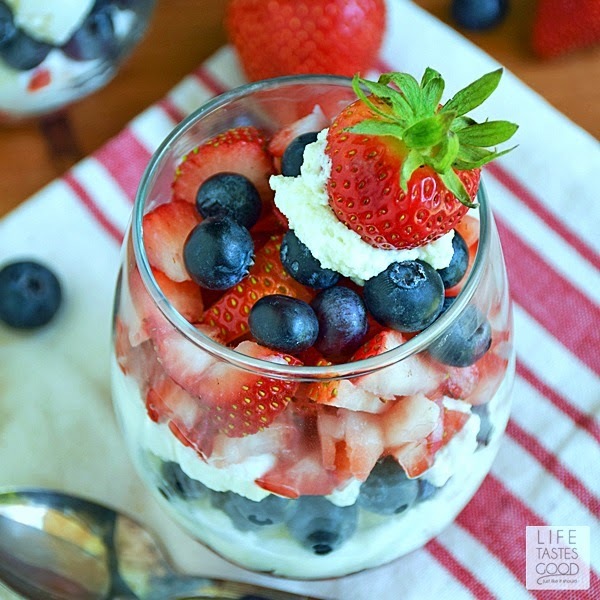 To assemble your parfaits divide the ingredients equally among 4 serving glasses by adding a tablespoon or two of diced strawberries first and top with a dollop of whipped topping mixture. 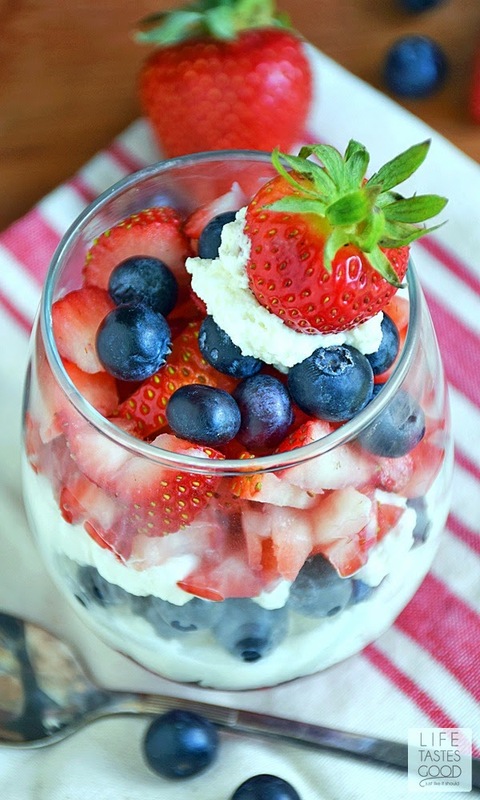 Add a layer of blueberries and top with a dollop of whipped topping. Add another layer of strawberries and top that with a few blueberries. Garnish with a strawberry dipped in the whipped topping mixture. Continue with remaining ingredients and serving glasses. Serve and enjoy! If you make these up ahead of time, you can just cover them and refrigerate until ready to serve. Mascarpone cheese goes so nicely with fruit. 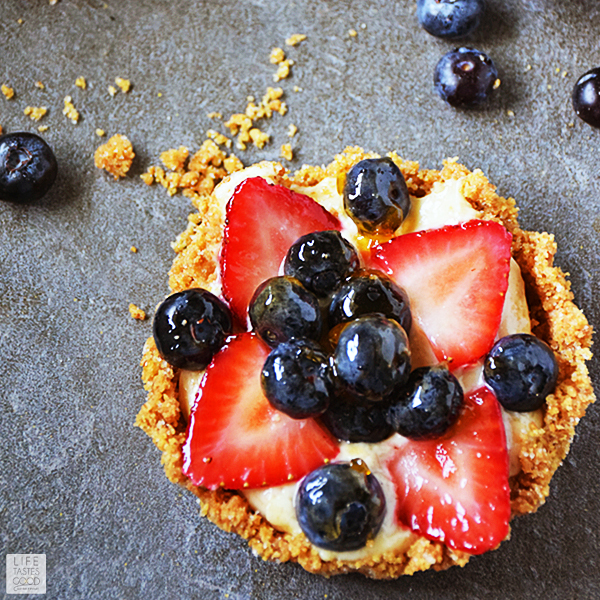 Great dessert for any patriotic celebration (and more too). Oooh, this is totally MY kind of dessert! So pretty and with white chocolate mascarpone cream??? Fabulous!! I like the fact that you used Mascarpone because that's not so common in pairing berry desserts, at least from what I've seen. Thank you for participating this week! I <3 mascarpone and fruit! These parfaits sound delicious Marion!! I've made something similar but never ever with melted white chocolate chips!!!! OMG, I've been missing out. Making this one this weekend. LOVE! Such a great looking dessert! I love that you added some white chocolate chips! Yum! Mascarpone makes this sooo decadent! Love! So pretty. Nice idea to add the mascarpone.